Even in the heart of London it is possible to feel a bit like you are living off the land. 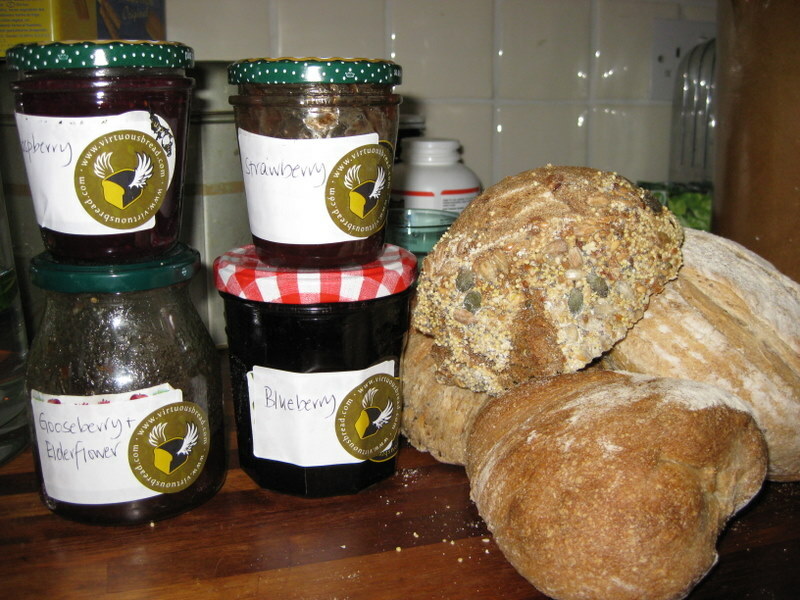 Great ingredients are not too far away and, although I would find it a challenge to pick and grind my own grain for the bread, it is as easy as anything to pick fruit and make jam. One of the sites of a fantastic PYO (pick your own for those of you who have not discovered fruit and veg nirvana) called Copas Farms is only a 15 minute drive from the global HQ of Virtuous Bread. They have everything there - berries, cherries, veg of all descriptions, plums, rhubarb....they open with asparagus and end with squash. It's amazing. Further, if you venture out into the countryside with a bag or a basket you can find wild cherries, plums, elderflowers and berries, apples, and pears not to mention mushrooms, nettles, garlic and a whole host of edible food that may be a bit less obvious. As children, my mother took us out of school to go picking fruit and we were set to work hulling, washing, chopping and scrubbing out jars. No school+jam milkshakes = we did not even moan even when it meant back breaking strawberry picking. My mother's jam is legendary. I think she probably supplies the entire neighbourhood and most of our friends. Blueberry, gooseberry, strawberry and raspberry: how to choose? Summer is great because of berries. 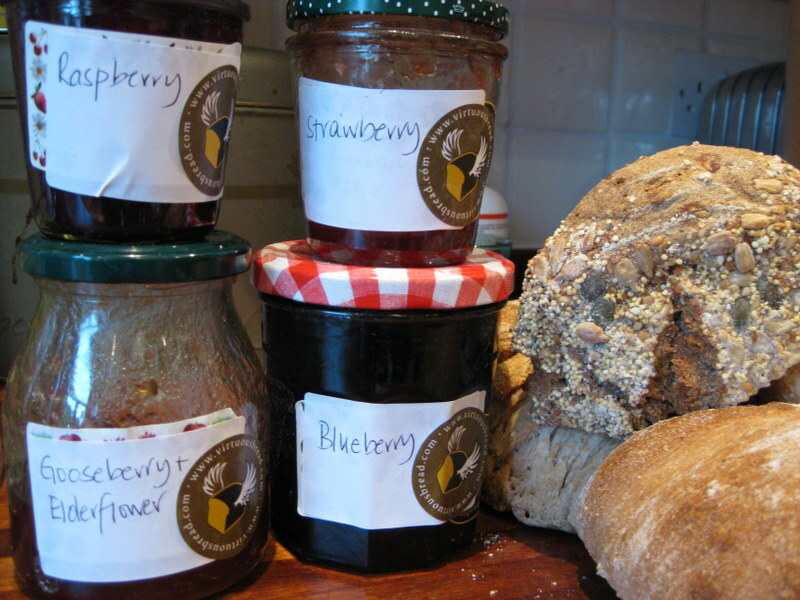 Stawberries, raspberries, gooseberries and blueberries make exceptional jam. If you have a bit of some or all of them you can put them together and make mixed berry jam. Served on fresh bread it is the best breakfast, lunch, dinner, or tea ever. Better than cake, better than sweeties! 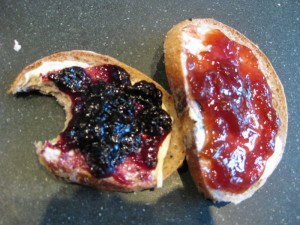 Berry jam on fresh bread = yum! Making jam is a great thing to do while you bake bread. As the bread rises you can clean fruit and jars and then boil it up and bottle! Keep some back in a wee bowl for slathering on your fresh bread, though. In my usual slapdash way, I boil up equal weights of sugar and fruit and hope for the best. For those of you who like a bit more precision, there are many great preserving cookbooks, and the one I love the most is called "Let's Preserve It" by Beryl Wood. Published in the 70's, this gem had been out of print for years but has now been reprinted and is available on Amazon (see link below). "Let's Preserve It" is the a-z of preserving and is the treasure chest from which my Banana Jam, so loved by my friend Jess Latchford, comes.